Saying goodbye to a loved one, whether they’re headed off on a far-flung adventure, or a romance that has gone sour, a friendship falters, is never easy, as with all matters of the heart. Saying your final goodbye, however, as you wage the war for your life after being diagnosed with a life-threatening illness, is another story entirely. Not only do you have to grapple with the intolerable pain that comes from your chronic illness, but you also have to stare at your own mortality in the face, and heartbreakingly ponder over the fact that you will never see your children go to prom, nor college, never see them walk down the aisle, and never hold your first grandchild. Mildly speaking, it’s a heartwrenching state of affairs. Faced with a seemingly date with destiny, would you leave a message for your loved ones, imploring on them that you’re always with them, even after you’ve gone? Providing them with the guiding tips to navigate their way through life, which you had hoped to do so by being by their side? Many people are now being given that opportunity to leave their heartfelt goodbye to their children thanks to the Thru My Eyes Foundation, which creates “living” legacy videos for people with life-threatening illnesses. We caught up with the Michelle Maidenberg, the Co-Founder and Clinical Director of the nonprofit organization, who shared among other things, the gratitude that families express having this gift of love left for them long after their loved one is no longer physically around. Kindness & Hope: Can you tell us a little about your background? Michelle: I am Michelle Maidenberg, PhD, MPH, LCSW, CGP. I maintain a private psychotherapy practice in Harrison, NY. I am also the Co-Founder and Clinical Director of “Thru My Eyes”, a nonprofit organization that offers free clinically-guided videotaping to chronically medically ill individuals who want to leave video legacies for their children and loved ones. A professional videographer and trained counselors are available at no cost to help guide clients through the challenging task of presenting a gift of lasting messages to their children and other family members. The organization was founded to empower those with life-threatening illnesses with the peace and knowledge in knowing that they will be remembered by those whom they loved the most. I created and coordinate the Cognitive-Behavioral Therapy (CBT) Program at Camp Shane, a health & weight management camp for children and teens and Shane Diet and Fitness Resorts, a resort focusing on health & weight management for young adults and adults. I’m an Adjunct Professor at New York University, teaching a graduate course in Mindfulness. I am the author of Free Your Child From Overeating: 53 Mind-Body Strategies For Lifelong Health. I am also a blogger for PsychCentral and publish articles in various publications and speak on a variety of topics including trauma, anxiety, mindfulness, ACT, CBT, health and wellness, parenting, grief, and bereavement. I am a Board of Directors member at The Boys & Girls Club in Mount Vernon, NY. I am also a member of the American Red Cross Crisis Team and serve on the Board of Directors of the Westchester Trauma Network (WTN). I have advanced training in CBT, ACT, Eye Movement Desensitization Reprocessing (EMDR), Structural Family Therapy, and Mindfulness. Kindness & Hope: How did you come up with the concept of ThruMyEyes? Michelle: In 2009, I met 40-year-old Dede at the gym I attend. Her blazing blue eyes (thus the name “Thru My Eyes”) and beautiful red hair were striking. After my exercise regimen, I was standing in the mirror getting ready for work. We got into a conversation about children and I expressed that I had four children and she disclosed that she had a daughter who was seven at the time. 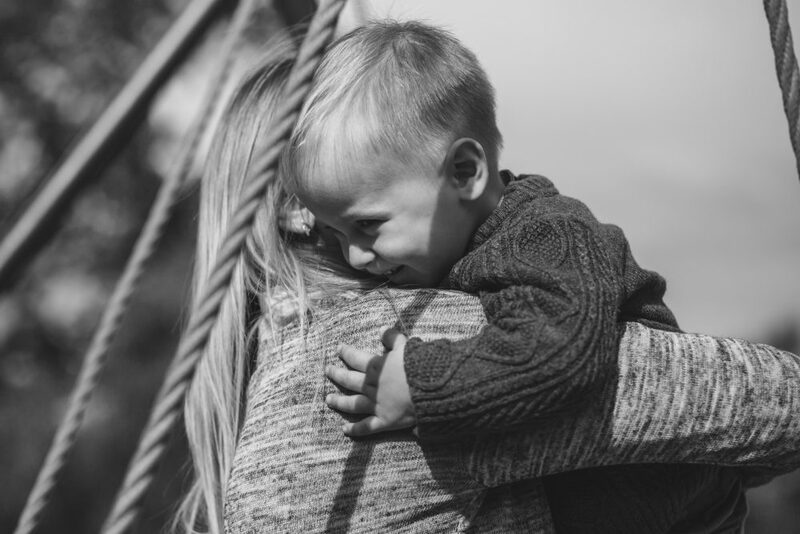 Through our encounters at the mirror she eventually shared that she always dreamt of having many children but because of her prior bout with breast cancer and her extensive treatment, at the time, she accepted that she would remain childless. She described her daughter as being her “true miracle” because she and her doctors believed she would never conceive. She expressed how thankful she was to be in remission and spoke of her journey of discovery and evolution toward committing to live a present and purposeful life. Approximately a year later, we stood by the mirror and she shared with me the facts about how cancer had returned and she was receiving aggressive treatment and understood that she was “in the fight” of her life. My heart sank. I watched as her hair fell out, she became progressively weaker and eventually could not make it to the gym any longer. A fighter she was. Dede worked out until she absolutely couldn’t anymore. I once asked her, how do you do it and muster up enough strength to come to the gym and remain so generous and positive. I’ll never forget her answer; it is forever burnished in my mind. She said during her last bout of cancer that she made the decision to live every moment of the rest of her life with appreciation and joy and planned to carry that out no matter what her demise. I marveled at her courage and motivation. Further along in her illness, she approached me about wanting to videotape herself discussing important milestones for her daughter so that she could be left with anecdotes and critical lessons for life. She asked if she could consult with me about developmentally appropriate topics to cover. I helped her come up with a structure from which she wanted to be videotaped. A few women at the gym did research on where they might offer such a service. At Sloan Kettering they had a videographer who came to the hospital only if a patient requested it. They had to be videotaped at the hospital, they had to pay for it, and they would be videotaped without any support or guidance. A few friends chipped in and we were able to get the videographer to come to Dede’s house to videotape. Out of this experience, I was committed to making this service for families readily available, effortless, supportive and empowering. I felt it should be offered at no cost so that all families, despite their socioeconomic status can benefit. Also, that families that are already incurring substantial financial stress do not have to be burdened with this additional expense. In addition, it should be accomplished in the comfort of a person’s home to preserve their dignity and integrity, and lastly, that a licensed mental health professional should be present throughout the taping so that they can offer emotional support and provide a script from which to guide the interview that was based on the topics they personally selected to discuss. Video footage of the family’s interactions (i.e., playing, reading, and practicing family traditions) are also edited into the final video legacy at the discretion of the family. I have gratitude that Dede had the opportunity to witness the initial growth of the organization and that we continue to provide this service to families to enrich their lives through such a traumatic and challenging time. Kindness & Hope: Is it hard to get people to participate? Michelle: Because of the process and need to get people to videotape when they are well enough to express themselves, it sometimes poses challenges. The process consists of sending licensed mental health professionals to people’s homes to interview the ill family member and create a video legacy. If the person lives too far away for us to visit them in person, we will conduct the interview online. When people realize they are chronically medically ill, they often have mixed feelings about wanting to leave a living legacy. For some, they associate creating the legacy with having to face their mortality and speak to their loved ones about their inevitable passing. For others, they feel immediately compelled to create the legacy, and teach their children certain life lessons, coach them through difficult developmental moments, instill values, and share momentous family memories. We’re understanding and empathetic to where anyone is in their process. Each person reacts differently and uniquely to being in this circumstance. We express to them that creating a video legacy is similar to having an insurance policy. We don’t expect to get sick, but we secure one, in the case that we may need it in the future. The videotaping is similar, whereas we don’t know where the trajectory of their illness will inevitably take them, but they have it in place no matter what happens. If they go into or stay in remission, it’s a gift that they can treasure. We have a list of over 200 questions from which to choose from, so we make sure individuals are comfortable with the questions they are answering. We also provide them with a flip camera or they can use their smartphone where they can record family interactions for a month before editing. People take footage of themselves reading to or playing with their children and we edit that into the video as well. Kindness & Hope: Are there challenges associated with you carrying out your mission? Michelle: Securing funding is challenging right now. Every year we have a fundraiser, but it’s time-consuming and there is a lot to coordinate. Additionally, creating the videos are expensive–with the videographer and editing, they each cost $1,500. We keep the videographer on staff because we need to have open access to him. Because of the nature of what we do, we need to coordinate and provide our services ASAP. We often get urgent calls of individuals desiring to film, unfortunately, they don’t have the luxury of waiting because of their compromising health condition. People often have difficulty facing their longevity, so we tend to get time-sensitive calls. Families often donate to Thru My Eyes after receiving a video, but those donations, unfortunately, aren’t usually enough to cover our daily operating expenses. Because of the multitude of benefits, it provides to grieving families, it would be devastating for us to close our doors. I’m currently looking for an individual or organization to partner with, accounting help, and assistance with fundraising. I’m also going to be turning over a new board of directors to restructure the organization and will need passionate dedicated individuals who are committed to our mission. Kindness & Hope: How important is it for those who are ill to leave this lasting memory for their loved ones? Michelle: The gratitude from families is beyond amazing. It is wonderful to be able to look back on a video of a mom or dad lovingly interacting with their children. Families appreciate receiving a video of their beloved family member. They often say, “I would never even think to do this or would know how to” or “How wonderful that we have this memory of my mother that I have forever.” In the past four years, we proudly created more than 150 videos for families. On our website on the home page and testimonial page, there are many individuals talking about their experiences and how much they appreciated having the opportunity to be videotaped. Kindness and Hope: Emotionally, it must be heartbreaking for you to see these people leaving their farewell message? How do you cope? How do you unwind? Michelle: It’s both heartbreaking and incredibly moving to interview these astounding individuals. I feel such honor and gratitude that they share details of their intimate lives with me. Each person’s story is so meaningful and powerful and exemplifies strength, courage, and perseverance. I’m typically moved to tears because of all the adversity that these individuals are going through. I feel a tremendous amount of compassion for each of them and can’t help but tap into my own feelings about my children and my mortality. This especially comes up when they have children of similar ages. I walk away from these interviews with rejuvenated respect for life. It really puts things into perspective and gives my life so much meaning to be giving back to others with warmth, kindness, and care. These moments allow me to reflect and ponder whether I/we are living in a way that’s meaningful and the way I/we want to. The way that I cope and unwind is through my Transcendental Meditation (TM) practice. I also write blogs which allows me to express myself and is extremely therapeutic, and I enjoy being with family and friends who are nurturing and supportive. Kindness & Hope: What do Kindness and hope mean to you? Michelle: Kindness is a core value of mine. It means acting kind, even though I may not feel kind or think kind thoughts. It’s what I am, when I’m my best self. I’m present, engaged, and kind to the person I’m interacting with. Hope means me being open to whatever comes my way without feeling especially attached to the way things are or the way they “should,” “must,” or “ought” to be. Kindness & Hope: What would be the message you would leave your loved ones? Michelle: I would want to share aspects of my life with them, reviewing my history and development with them. I would want them to know how much gratitude I have for each of them, and how much they positively contributed to my life. I would also want to advise them on various aspects and stages in their lives such as on their friendships, intimate relationships, child rearing, career, family, traditions, and values. I would want to stress prioritizing what’s truly important and the importance of slowing down and living life mindfully and meaningfully. Kindness & Hope: How can people be in touch with you? Michelle: My personal website for my blogs and private practice is www.michellemaidenberg.com. Thru My Eyes can be found at www.thrumyeyes.org. I’m on Facebook at Dr. Michelle Maidenberg. I post several times a day on articles that have content that is inspiring, informative, and thought-provoking. I also post a daily meaningful quote. Previous StoryIn these tumultuous and challenging times, let’s all try and uphold the values & ideals of Martin Luther King Jr.